Komovi located as gradient built up between the Kucka Krajina and the Prokletije mountain ranges, at the far east of Montenegro, bordering with Albania is considered as one of Montenegro’s more beautiful ranges, after the ones of Durmitor and Prokletije. The range is characterized and dominated by the beautiful twin peaks of Kom Vasojevicki (2461 meter) and Kom Kucki (2487 meter). Or better and more accurately the triplet peaks, because Kom Kucki is a divided into two summits although depending on which side you viewing it looks to appear as one. The other peak is named Kom Ljevorijecki and is with his 2469 meter a little lower than his bigger brother, but also he can claim to be part of the regions history, culture and the accompanying legends. 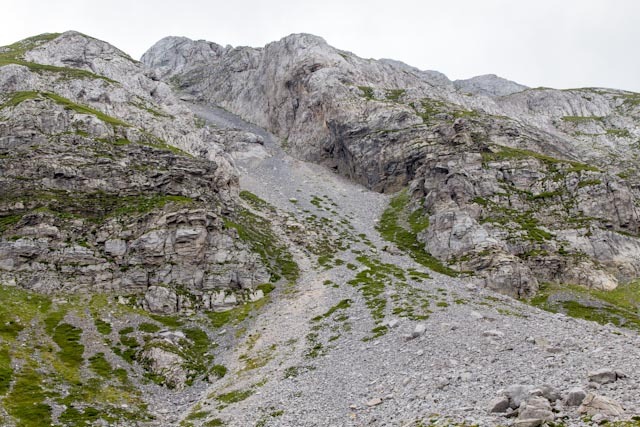 The story goes that local clans battled over who could make the claim of the area’s highest mountain and started to pile up rocks on the nearest peaks to become victorious. The pilling remains a legend and there can’t be find any remaining evidence of it, but what’s certainly not a legend is that all the living clans of Vasojevicki, Kucki and Ljevorijkecki gave their clan name to the peaks. The pre name Kom derived of the fact that it was the historic name for the larger area surrounding the range in earlier times. So the legend remains as a good legend befits a mystery but it describes one of the peaks best attributes quite appropriate, it’s accessibility. 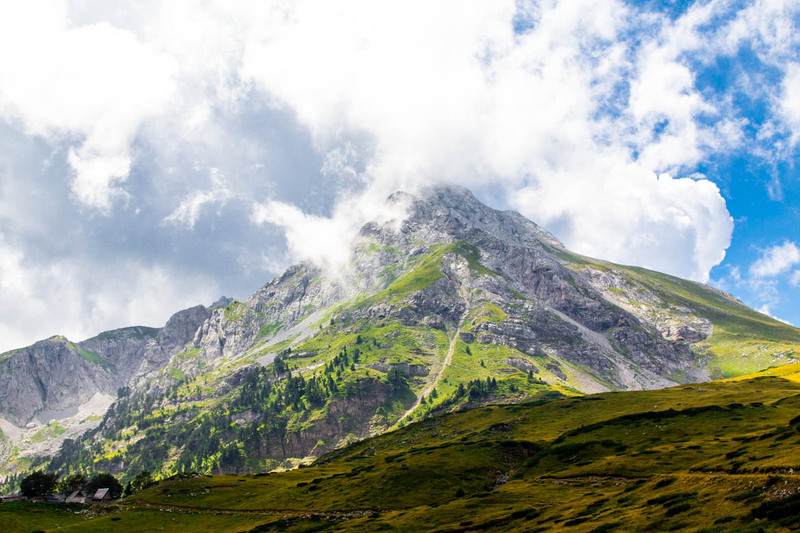 Although his neighbors of Durmitor and Prokletije might be higher, wider and more abundant, the Komovi mountains are easier reached. Both applying as well for the peaks as the mountain it self’s. 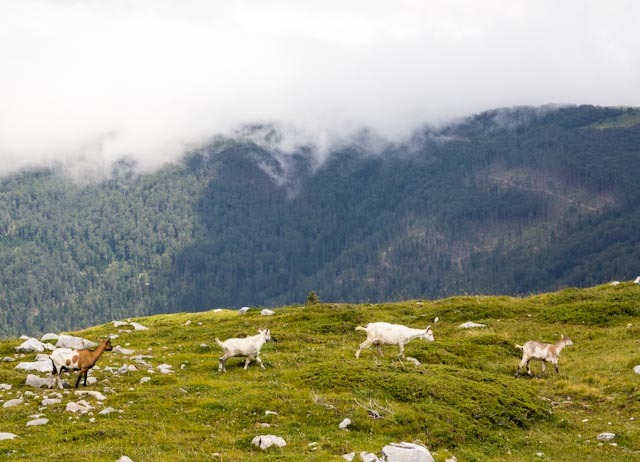 There are a couple of Katuns surrounding the mountains, but the area dividing is mostly done by the two larger plateau pastures of the katuns of Stavna and Ljuban. 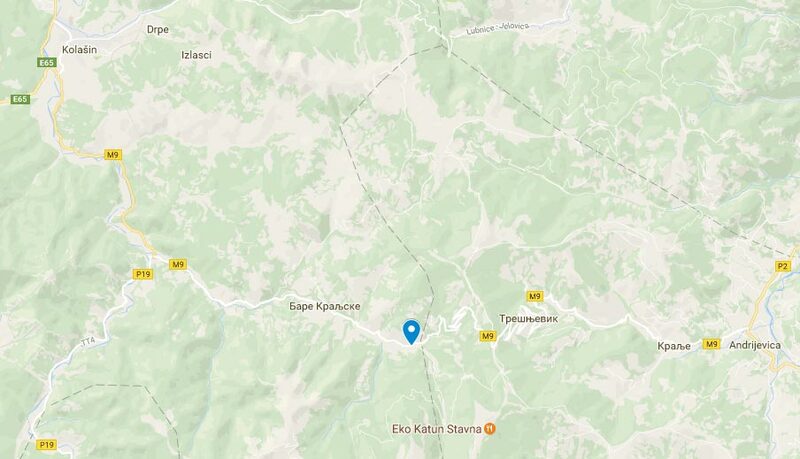 The other two possibilities are the Katuns of Popovici (Carine, 1870 meter) and Pricelje. 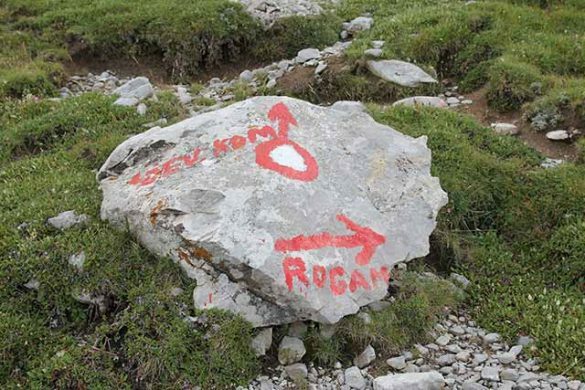 So when deciding to visit Komovi, the first question that must be asked their self’s is which side people decide to use as starting point to enjoy, hike and climb the range. 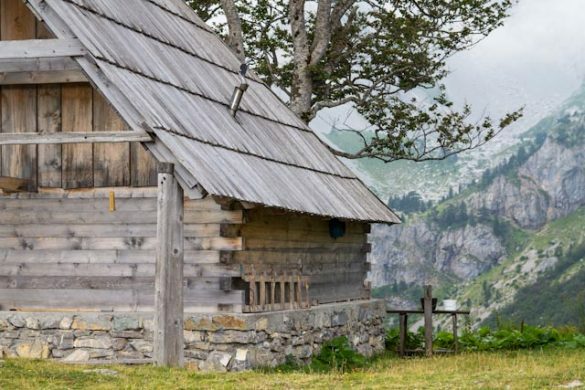 Stavna is the most visited starting point mostly off the reasoning of the best road access and the availability of accommodation in the form of large wooden huts. 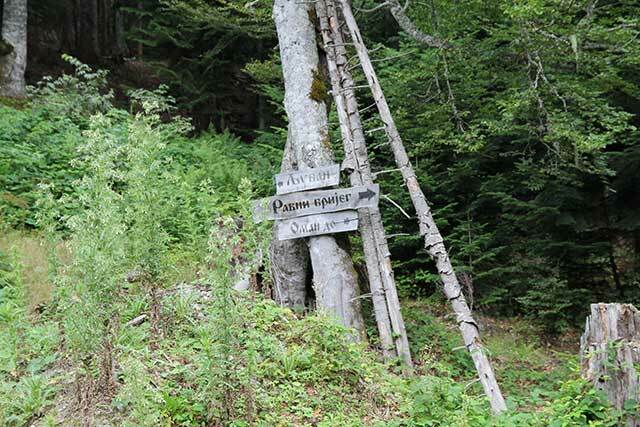 In this description to visit the Komovi mountain range the route to the Ljuban pasture and Kantun is followed. 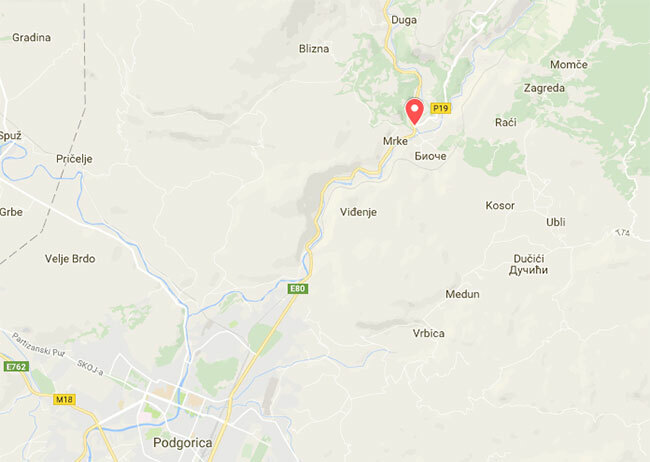 From the capital of Podgorica take the highway to Kolasin (E80), you can choose to follow it all the way to the city or take the exit at the first junction at Boiće (10 kilometer, right). Junction at Bioce to the scenic road. Follow the scenic asphalt road in the valley of the river Mal Rijeka to Verusa passing through villages such as: Jelin Dub, Klopot, and Preljubovice continuing to Matesevo. 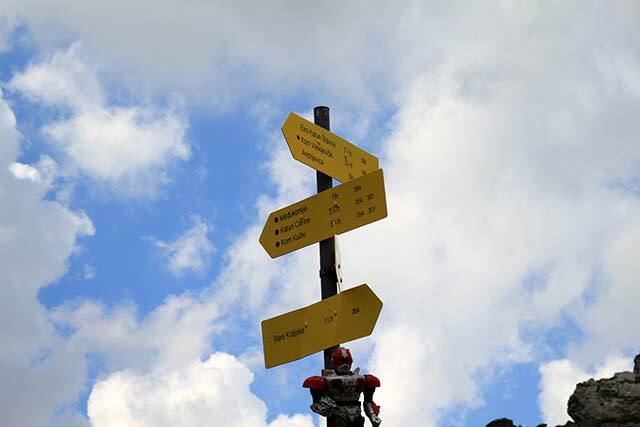 Here at the junction, take another right to the city of Andrijevica, follow it until you reach the small intersection to Tresnjevik (around 60 kilometer from the Bioce junction). This is a gravel road and little steep at some points so not perfectly suitable for all cars or drivers. So for the ones not daring its best to park at a safe location in the vicinity. 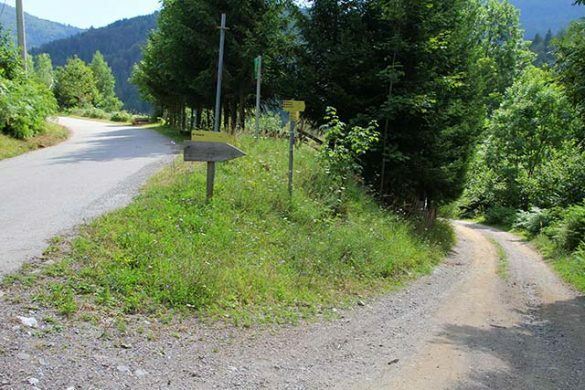 The gravel road takes up to 8,5 km to arrive at the Ljuban starting point. For those willing to visit from the Stavna pasture then continue straight at this intersection for 6,5 kilometer to reach at the Stavna junction, here follow the signing to reach the Stavna Katun and accommodation’s after 4 kilometer. 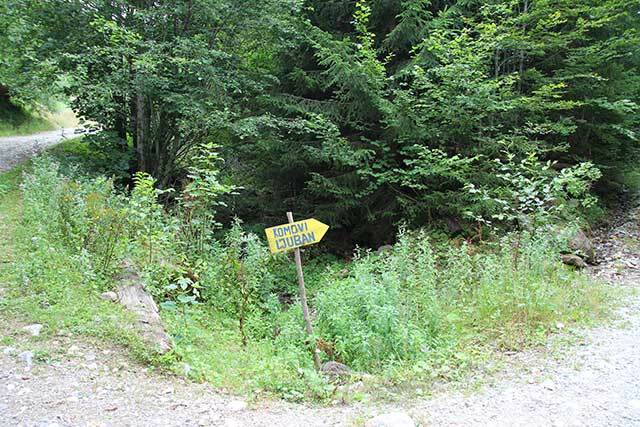 The people who choose to not take the scenic road and continued all the way up to Kolasin, follow from there the directions to Andrijevica to arrive at the same road leading up to Komovi. Back to the gravel road follow it down until you reach a yellow sign with Komovi Ljuban on it directing to the right. Junction to the gravel road. Yellow sign post the right. Wooden sign point to the left. This sign is not the most stable so the possibility that it is fallen over could have occurred. Don’t worry the ascending route leads to a dead end and a couple of houses a little higher up. The gravel route winds up a couple of times before reaching the last junction. The wooden tree signing is written into Cyrillic so quite confusing for those not able to read it. But the Ljuban direction is to take the left here, follow it and in a short time the forest will slowly open up and you will be starting to witness the beautiful peaks of Vasojevicki, Kucki and Ljevorijkecki. Junction to the gravel road to Ljuban. 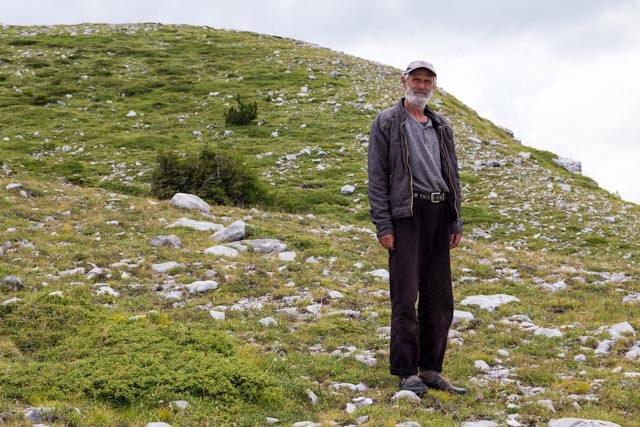 Just follow a little up and will shortly arrive at the beautiful Ljuban pasture marked by a large wooden billboard. If you came by car, it’s a nice spot to park here, or if you reached by foot to continue. 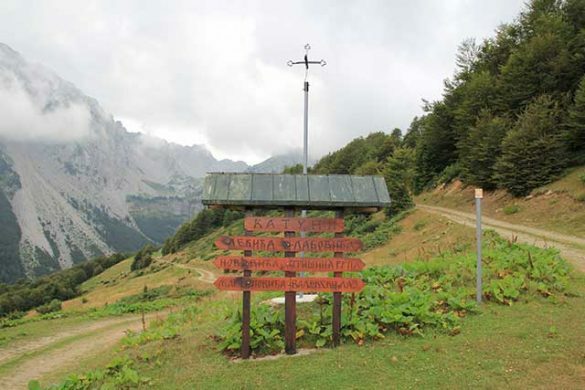 The starting point is quite central and multiple hiking trails from can be chosen from here. Even that is it slightly more located at the Kom Kucki side, both peaks can be reached at almost the same time of approximately 3,5 hours. 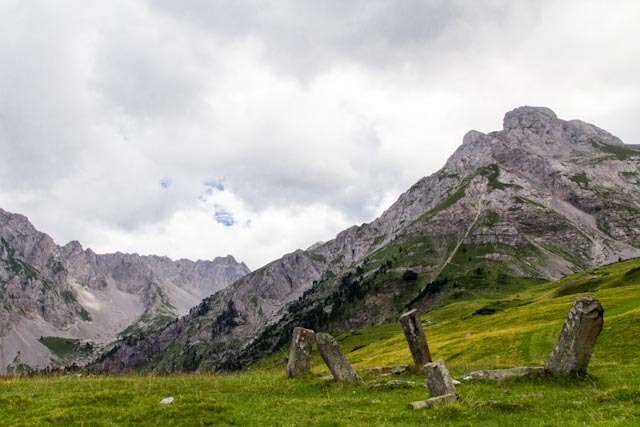 In general the trails are easily walk able and marked by the common hiking signing, but the last parts of ascending to the peaks are a lot more demanding and certainly need a real amount of scrambling and a decent physical condition. So some preparing and caution certainly need to be used. Some water springs can be found at the Katuns (Stavna has the two most reliable) but always take care of taking enough of water supply while hiking the area. Quality hiking shoes and poles are definitely advisably when summoning the peaks. For those willing there is a possibility to hike the so called Komovi Circular, and alternative round trip around all three peaks, which offers good views to all of them. 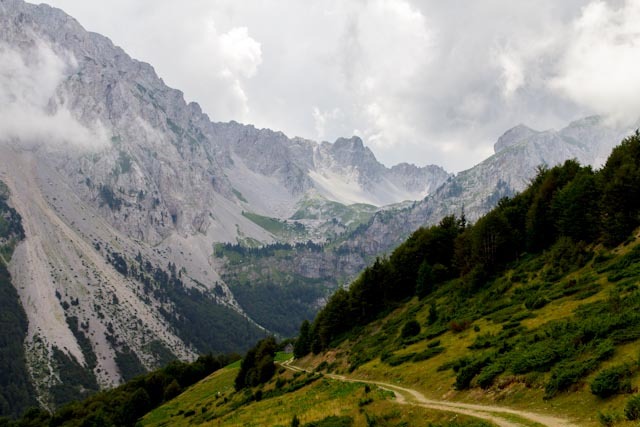 The hike totals more then 20 kilometer and although no peaks are climbed, don’t be fooled ; it is not a lightly stroll, in fact you are likely to climb more than if you were to climb Kom Vasojevicki. But all the hikes will offer the same wonderful combination of diversity of natural attractions, rich flora and fauna and numerous cultural experiences. Happy hiking and enjoy !